PRIMMS® orients the team to meeting project objectives by ensuring that each milestone produces its required deliverables and meets its sufficiency criteria on schedule and on budget. In PRIMMS® every project exists as a discrete object and is accessible through a dropdown menu. 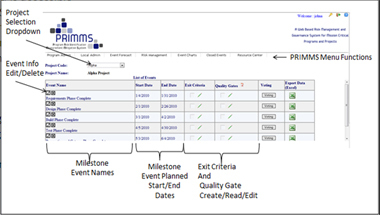 For each project in PRIMMS® milestone events are planned with delineated start and finish dates. The milestone event exit criteria can be added by clicking on the pencil for each milestone. Quality Gate sufficiency criteria can be planned and updated by clicking on the pencil for Quality Gates for each milestone. With PRIMMS® project managers do not have to struggle with handling lists of thousands of activities. 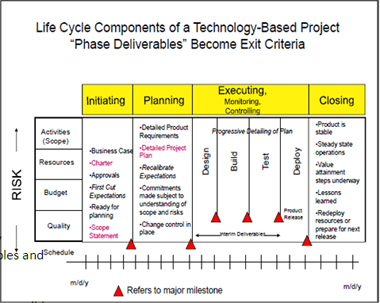 Instead managers focus only upon the deliverables and their completion and quality criteria. This reduces complexity and enables the team to focus upon what is important.